Modern-day renaissance woman India Hicks is a model, an author, an interior designer, a business woman… oh, and an heir to the British throne. Her collaboration with the Royal Warranted Crabtree & Evelyn is a match made in heaven, and has produced a truly luxurious range that is inspired by her idyllic life in the Bahamas. The scent of Island Living Spider Lily evokes brightly coloured coral, the swishing of palms, trees laden with tropical fruits, gently blooming flora and sea spray, and works to transport you from your bathroom to the crystal clear waters of a tropical paradise. The cotton fabric vanity case opens up to reveal an entire regime of bestselling products from the collection. Pamper your skin with the gentle Shower Gel made with aloe and hibiscus, and the quenching Body Lotion with tropical mango seed oil and honey extracts. For your extra dry bits, cocoon skin with the thick and luxurious Body Cream made with lashings of island mango oil and avocado butter. Finish off with a liberal spritz of the uplifting Island Living Spider Lily Eau de Parfum. 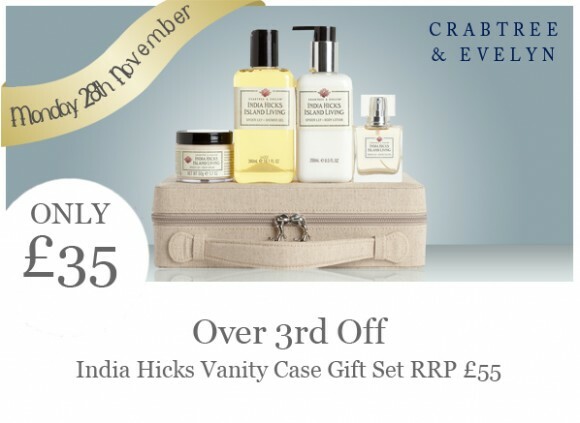 Take a closer look at the Crabtree & Evelyn India Hicks Island Living Spider Lily Vanity Case Gift Set right here – it’s £35 for one day only! My mother tried this fragrance in the summer and I loved it so much had to get it for myself. It is one which lingers without being overpowering. Having the range is great as I can float along in my own paradise - especially on winter days like today! This entry was posted on Monday, November 28th, 2011 at 8:00 am and is filed under Christmas, Gifts, Offers. You can follow any responses to this entry through the RSS 2.0 feed. You can skip to the end and leave a response. Pinging is currently not allowed.